You can now take your Ardor and Ignis with you on-the-go after downloading the Ardor Lite wallet from the App Store and Google Play! All the credit for this accomplishment goes to community member and recently deputized ANG-board member, Mrv777 – thanks for your hard work. Before there were “Weekly Wins,” there were just Ardor Updates. Stay up to date with all the exciting developments from across the Ardor and Nxt communities with these short monthly videos from Skylar Hurwitz on the Ardor youtube channel. Jelurida is proud to announce that is has secured membership in the Singapore Fintech Association and the ACCESS Blockchain Association. Singapore has long held a reputation for being the tech hub of Southeast Asia and Jelurida is committed to expanding its presence in the region. Jelurida will be a platinum sponsor for the American University in Bulgaria’s third student-led “Hack AUBG” hackathon from February 15-17, 2019. Core developer Petko Petkov and customer support specialist Iassen Hristov will be on site to mentor participants during the event. Last week, you got to see a live video of Alberto giving an Ardor pitch in late 2018. 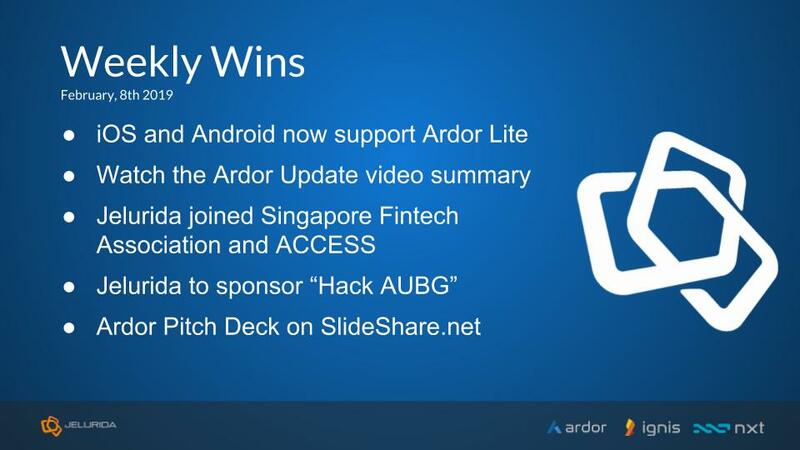 This week, the “Introduction to Ardor” pitch deck recently used during the LongHash Hatch incubator program was made available on Slideshare.